Fireworks Popcorn... Enjoy an explosion of flavor with Fireworks Popcorn! Fireworks prides itself in the variety of popcorn they offer, taste the difference. 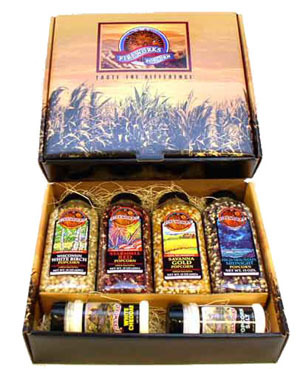 As shown, the Fireworks Popcorn gift set makes the perfect gift for mailing to clients, family & friends. Please see our Popcorn & More selections for Odell's Popcorn Butter, Fireworks Popcorn Popper Gift Set & Enamelware Popcorn Serving Bowl Sets. Fireworks Popcorn & Seasoning Set. Set includes four 15 oz. jars of distinctly different popcorn & two large seasonings. Starshell Red Popcorn: Crunchy, Rich Flavor. Wisconsin White Birch Popcorn: Light, Crispy Texture. Savanna Gold Popcorn: Smooth, Sweet Flavor. High Mountain Midnight Popcorn: Robust, Wild Flavor. Shake on Fireworks Popcorn Salt & White Cheddar Popcorn seasonings for a unique treat!